The Annunciation Cathedral is the oldest monument of Orthodox church architecture. It was founded more than 450 years ago; it survived after the heaviest fires and several reconstructions. The cathedral is located at the very heart of the Kazan Kremlin, near a small park with the monument commemorating Pskovian architects and the viewpoint. Thanks to first President of the Republic of Tatarstan, Mintimer Shaimiev, the cathedral was fully reconstructed in 1995-2005. The cathedral was consecrated and became accessible for visitors. Some of the incorruptible relics of the first bishop of Kazan, Abp. Gury, are kept in the cathedral. The Annunciation Cathedral is open every day. Masses are held on public holidays. Kazan's main pedestrian street starts at the Kremlin and ends near the Ploschad Tukaya (Tukay Square) metro station. It's often called “the Arbat of Kazan”, because the numerous restaurants, souvenir shops, and fashion boutiques attract tourists and locals. The length of the street is almost 2 km long, and almost every building or temple located on it has its own special story. Formerly, it was called Prolomnaya because during the capture of Kazan Ivan the Terrible's cannons broke the Kremlin wall exactly from the direction of this street. Two well-known Orthodox cathedrals – the Nikolsky Cathedral and the Epiphany Cathedral – are also located on Bauman Street. The bell tower of Nikolsky Cathedral is one of the highest bell towers in the world and can be seen even from near the Kremlin. When walking along Bauman Street, you will notice the buildings of the State Academic Russian Bolshoi Drama Theatre named after Kachalov and the National Bank of Tatarstan that contained the gold reserve of Russia during the October Revolution of 1917. The street is also decorated with a replica of Empress Catherine II's carriage that is often surrounded by crowds of people wanting to take a picture with it. Tourists especially love the Kazan Cat Statue and the numerous fountains located throughout the length of the street. Bauman Street also has the so-called Kilometre Zero that shows distances from that point to several major cities of the world including Moscow, Rome, and Paris. The Blue Lakes is the common name of three karst lakes in the vicinity of Kazan. The natural park includes lakes Bolshoye, Protochnoye and Maloye, as well as the protected natural area around them. The temperature in the lakes is between 4 – 6 °С both in summer and winter, which is why the lakes are so popular for cold water training and winter swimming. Those not keen on cold water swimming will enjoy contemplative recreation and walks along the lakeside. Specifically for that purpose Lake Maloye has platforms for picnicking designed around it. The crystal clear water that never freezes in winter attracts divers from all over Russia. The Kazan Divers Club is based right there, and they organize diving sessions both during the daytime and at night. The lakes take their name from the remedial blue clay found at their bottom. A short distance away from the lakes is a health resort that treats a variety of diseases. The water in the lakes is so transparent that it creates the optical effect of a lens: the lake seems not more than one meter deep, although in fact it is as deep as 18 metres at some spots. The Chernoye Ozero (Black Lake) Park is located in the downtown area, in the close proximity of the Tatar State Opera and Ballet Theatre named after Musa Jalil and the main building of Kazan Federal University. This park has been recently renovated under a government programme, which is why it has the look of a very modern area and is ideal for leisurely walks. The entrance to the park is marked by the "Lovers' Arch". It is a popular belief that if two people stand inside niches on two opposite sides of it and one of them whispers a word, the other person will hear it. This acoustic experiment is a favourite entertainment of young citizens and tourists. If you get a chance to be there, do not forget to check whether it really works. In the centre of the park you will find an open amphitheatre and a square with a colonnade in front of it. During the warm season this is a popular venue for concerts and festivals. The park has lovely, shaded benches that can be used to escape the hustle and bustle of the city. The park also contains several well-designed playgrounds for children and an exercise equipment area. At the Galiaskar Kamal Theatre you can see authentic theatre in the local language of Tatar, as well as experience unique architecture including building with a unique roof, called the ‘gate to the Staro-Tatarskaya Sloboda’. The theater is located in the heart of Kazan on the boarder of the historical area of the Staro-Tatarskaya Sloboda. It is symbolic, as this exact area was home to writers and poets whose work can be see seen at the theatre today. The repertoire features notable Tatar productions, modern plays, and classics from around the world. The performances are always staged in Tatar. For spectators convenience the simultaneous translation to Russian and English is provided. Every two years the theatre stages the International Theater Festival of Turkic Nations ‘Nauryz’ which brings together more than 500 guests and participants from Russia, Turkey, Azerbaijan, Turkmenistan, Kyrgyzstan, Kazakhstan, and other countries. The Galiaskar Kamal Theatre is one of the best places to explore the Tatar culture. Due to the high demand we recommend purchasing tickets in advance. Tickets can be purchased online or in person by visiting the theatre box office. The Gorky Park is the centre of attraction for those who enjoy active leisure and recreation, picnics or walks with children. It is located on several hills which is why it used to be called Russian Switzerland. The park has everything one needs for leisurely time: almost one hectare of green lawns, areas with fitness equipment, a breezy forest area, coffee shops and restaurants, sculptures and a colour music fountain. The latter has special popularity with children; it's a foot-walk fountain which allows them to joyfully run between its water spouts. Right next to the Park is the Trudovye Rezervy Stadium that has a sports gear rental service working all year round. Founded in the 10th century, the ancient town of Bolgar was the economical, political, and cultural centre of the Volga Bulgaria. The Bolgar Historical and Architectural Museum and Preserve is located 140 km from Kazan and is the northernmost monument of medieval Muslim architecture in the world and a unique example of Bolgar-Tatar architecture of the mid 13th – 14th centuries. In the central part of the ancient settlement you will see the preserved ruins of the Cathedral Mosque and the Great Minaret. Right next to them is the Northern Mausoleum which served as the tomb for the Volga Bulgaria noblemen. Among other ancient structures of that period are: the White and Black Chambers, the Eastern Mausoleum, and the Khan Bath. Other open sights include the unique Museum of Bolgar Civilisation combined with the river boat station and the "Memorial Sign Commemorating Volga Bulgars Adopting of Islam in 922" where you will see the biggest printed Quran in the world. The Khan Palace, the Healer's House and trade shops, as well as the White Mosque and the Bread Museum are located behind the Southern Gates of the settlement. The Bolgar Historical and Archaeological Complex is included on the UNESCO World Heritage List. You can reach Bolgar from Kazan both by bus and by a river boat. The island town of Sviyazhsk is a place unique for its history and geographical position. It was constructed for the siege of Kazan in 1551 at the orders of Ivan the Terrible. The surprising thing is that the town was first completely built in the vicinity of Uglich, then it was dismantled into pieces with every log being marked, then taken by rafts down the Volga River and reassembled at the chosen place without a single nail. There is one building preserved from those times; the Troitskaya Church, the only monument of Russian wooden architecture of the 16th century in the Middle Volga. The town became an island after Kuybyshev Reservoir was opened in 1956. Most of the local residents' homes were flooded, and the ancient structures only survived due to being located on a hill. Today the island hosts country-wide music festivals, archery tournaments, culture and tourism fairs, and religious ceremonies. The beauty of the island town attracts artists and poets, many of them even choose to stay and live there. The expanse of Volga, the steep shores, the ancient churches captivate them, as well as tourists, for their peacefulness and its very special aura. Upon seeing the island town of Sviyazhsk great Russian poet AlexanderPushkin said that it was the Buyan island and the Lukomorye from his fairy tales. Assumption Cathedral and Monastery of the island town of Sviyazhsk is included on the UNESCO World Heritage List. The Kazan Family Centre is a unique building with an unusual architectural style. It is located on the right bank of the Kazanka River opposite the Kazan Kremlin. Kazan locals call it “the bowl” because its shape resembles a bowl or copper, and that is not a coincidence. According to popular legends, the name Kazan is derived from the Tatar word meaning copper or bowl. The roof of the Centre is one of the best observation platforms in Kazan. From here you can enjoy a magnificent view of the Kazan Kremlin and other sights; it is a popular venue for newlyweds and tourists. The platform has two levels and is located 32 metres above the ground. Around the Family Centre are several statues of snow leopards and zilants that are supposed to guard the newly married couples from troubles and hardships. The surrounding area is full of green lawns and lanes for walking and cycling. A short walk away from the Centre you will find a boat landing where you can rent boats and catamarans. The Kazan Kremlin is located right at the very heart of the city, on the higher bank of the Kazanka River. It is the only surviving Tatar fortress in Russia, and it also shows some traces of the original city-planning layout of Kazan. This complex's architecture naturally combines a variety of cultures: the Volga-Bulgarian culture, the Golden Horde culture, the Medieval Kazan-Tatar culture, as well as Italian and Russian cultures. The complex is truly a tourist gem. Seven museums are located within its walls, as well as the "leaning" Suyumbike Tower, the Spasskaya Tower, fragments of Kazan khans’ tombs and the Governor's Palace. The neighbouring Muslim Kul Sharif (Qol Sharif) Mosqueand the Orthodox Annunciation Cathedral are a prime example of peaceful coexistence of the two religions in this region. The Kremlin's sightseeing platforms offer magnificent views to the Kazanka River, the Millenium Bridge, the Palace of Farmers, the Kremlin Embankment, and the Kazan Arena Stadium. The Kazan Kremlin was declared a UNESCO World Heritage Site in 2000. The Kazan State Theater of Young Spectators (TYS) is widely known for its repertoire. In addition to plays for kids, there is also a choice of performances for youth and adults. In general, the plays are based on literature works and raise the issues and topics which are dear to every spectator. Famous artists, and laureates of international competitions and awards represent the troupe. They all take part in charity events and concerts. TYS is situated in the building of the former Merchants' Assembly. The exuberant architecture of the building always attracts attention of tourists and is an excellent background for your photos. The Kremlin Embankment is a new sightseeing attraction in the downtown area of Kazan. It was opened in 2015 and immediately became a favourite place of leisure and recreation for both local residents and visitors of the city. It connects two very important areas for walks and recreation: the Kazan Kremlin and the Kazan National Culture Centre. The perfectly smooth pavement of the Kremlin Embankment is ideal for roller skating or cycling. The cycle lanes are separated from the promenade area, which makes cycling much safer. The sports gear can be rented in the kiosks that are also located here. The Embankment is a place to take the most impressive pictures: the beautiful views of the Kazan Kremlin, the Kazanka River, and its far bank with Kazan Arena Stadium and Kazan Family Centre will serve as an excellent background both during the day and at night. On the Kremlin end of the Embankment you will find a few fountains. The Kremlin Embankment is a hot spot for good food. Restaurants of European and Asian cuisine, coffee shops, and a pancake house are open all year round. In winter an almost one km long skating rink opens on the Embankment, as well a fairy tale ground with Ded Moroz's (Grandpa Frost's) House. The Kul Sharif Mosque is the landmark of the Kazan Kremlin. Its turquoise minarets go up to the sky, and white marble walls have a pale pink sheen at sunset. The mosque is named after a great Tatar public figure, sayyid Kul Sharif. The Kul Sharif Mosque is a building of the 21st century, erected on the site of a multi-minaret mosque destroyed by the army of Ivan the Terrible during the siege of Kazan in 1552. In 2005, it was opened again in celebration of the millennium of Kazan. Its architecture is close to the original Al-Kabir cathedral mosque (13th century) in the city of Bolghar. It was a symbol of Islam in the Volga Region. Four architects worked on its design. 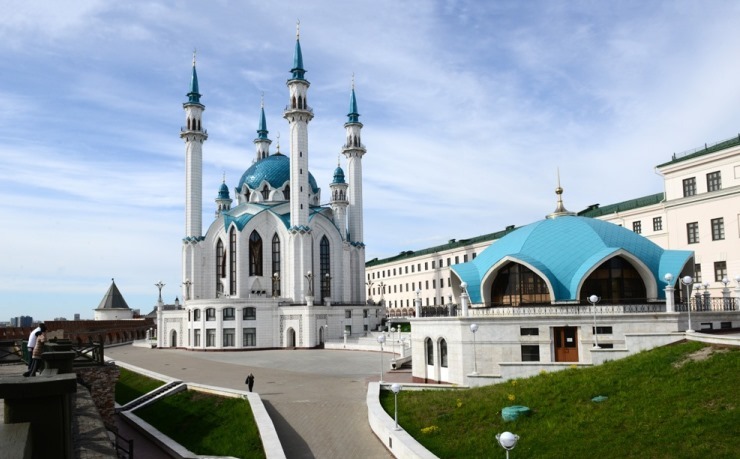 Enterprises, sponsors and average citizens of Tatarstan donated money for the construction of the mosque. Nowadays religious ceremonies are held in the mosque. Outstanding representatives of the Islamic culture give lectures there. Besides the main mosque building, there is a museum of Islam. This lake has been the subject of films and legends, appearing in all regional tourist guidebooks. Legend has it that on its bottom is the treasure of khans, hidden there from Russian Tsar Ivan the Terrible. Citizens love telling stories about this treasure being guarded by Su Anasy, a fairy-tale mermaid that drives any person looking for the treasure to madness. The origin of the name Kaban has several different explanations. Some researchers assume that it is related to the legend about Khan's son Kabanbek, others think that the name appeared because there were many wild boars ("kaban" in Russian) harbouring its shores back in the day, and some people believe that the lake used to resemble a boar's head. Scientifically speaking, it is an entire system of lakes (Nizhny, Sredny, and Verkhny Kaban) with the total length of 10 km. The most well-known part of it is located in the downtown area of the city near the Old Tatar Settlement and Bauman Street. A family of swans has recently made the lake their home, immediately becoming favourites of the citizens and visitors of Kazan. These swans are looked after by workers of the Kazan Zoo. Alongside the lake are convenient pedestrian embankments of the Old Tatar Settlement and Galiaskar Kamal Tatar Academic Theatre. There is also a rental service for boats and catamarans, while in the lake itself there has been installed a large fountain that can be seen from afar. The National Museum of the Republic of Tatarstan is one of the biggest museums of the Volga Region. Located in a former hotel courtyard, the museum occupies nearly a whole block. The museum houses 800,000 valuable exhibits from different eras, including the carriage of the Russian Empress Ekaterina II. Equally valuable are the collections of ancient coins, dating back to the Stone, Bronze, and Iron Age from the excavations in the Ananyinskiy burial ground, manuscripts, and belongings of exceptional Tatar artists. Modern technology within the museum enables adults and children to travel to different eras and witness history through their own eyes. Guided excursions are available in English, Tatar, and Russian. 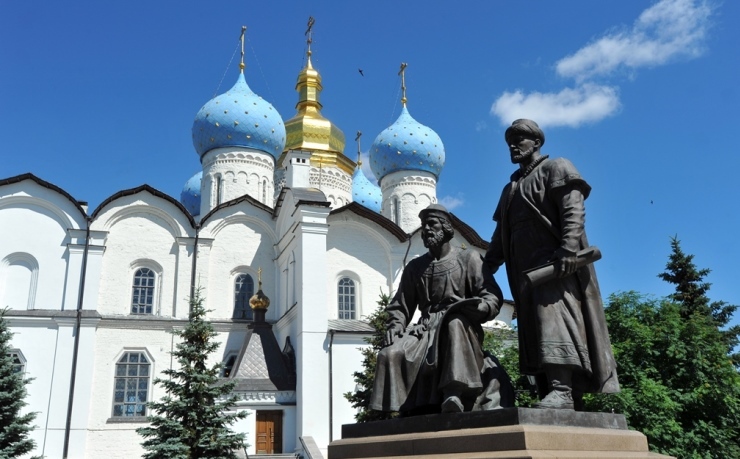 The museum is easily accessible from every part of Kazan, as it is located in the center of the city by the Kremlin. Tickets can be purchased in person at the museum. The Old Tatar Settlement (Staro-Tatarskaya Sloboda) is usually believed to have originated in the 16th – 17th centuries. Today it is a favourite place for walks and recreation for both local residents and tourists. The Settlement begins at the Kamal Tatar State Drama Theatre where plays are staged in Tatar with simultaneous translation to Russian and English. Along the picturesque embankment of the Kaban Lake you will find numerous restaurants and coffee shops, most of them serving traditional Tatar food. Walking along the embankment, if you turn to the right at Pereulok Fatikha Karima, you find yourself on the pedestrian Ulitsa Kayuma Nasyri, which has a number of authentic old houses and mosques. Historically the Old Tatar Settlement was a residential neighbourhood for Tatar intellectuals and prominent people: educators, poets, authors, artists, imams, and well-known merchants. Of particular interest are Shigabuddin Marjani 's House, the Yunusov-Apanayev House, Shamil's House with the museum of Tatar poet Gabdulla Tukay, the Kayum Nasyri Memorial House, the Yusupov House and many others. Alongside the streets of the Settlement you will find hotels, authentic souvenir shops and stores with popular Tatar craftwork items. Here you can purchase unusual handmade souvenirs, try the local cuisine, and fit on traditional Tatar costumes. The Palace of Farmers is an impressive, eclectic building known as one of the symbols of Kazan and is present on most tourist postcards of the city. The Palace is the official residence of the Ministry of Agriculture and Food of the Republic of Tatarstan. The central element of the façade is the bronze tree that represents fertility and prosperity. In the evenings its green illumination resembles leaves from trees. Palace Square is located nearby, and every autumn it hosts the International Kazan Autumn Open Air Opera Festival featuring the Republic of Tatarstan State Symphony Orchestra as well as several other city-wide events. The Raifa Monastery is the largest Christian Orthodox complex in Tatarstan, attracting pilgrims from all over the country. Located 27 kilometres from Kazan, it was founded by famous hermit monk Philaret. It is particularly pleasant to walk around the grounds of the monastery well tended by the novitiates. You will find very special placative atmosphere here; near the walls of the monastery are a picturesque lake and ancient forests. There is a saying that the local frogs never croak so as not to disturb the monks' prayers. The monastery's grounds contain the Cathedral of the Georgian Icon of the Mother of God in which the eponymous miraculous icon is kept. Every year thousands of believers arrive here to worship the icon. There is a special hotel here opened specifically for them and called "Dom Palomnika" ("Pilgrim's Home"). The construction of the Saints Peter and Paul Cathedral in Kazan is closely associated with Emperor Peter I's name. Before his Persian campaign, Peter I visited Kazan. In commemoration of this visit, a local merchant that was among the people visited by the Emperor, ordered to build a stone cathedral in place of a small wooden church. The Saints Peter and Paul Cathedral was consecrated in 1726. Almost every Russian Emperor has visited it since then, as well as French author Alexandre Dumas, scientist Alexander von Humboldt and Russian poet Alexander Pushkin. Feodor Chaliapin used to sing in the Cathedral's church choir. The Cathedral survived several fire outbreaks and more than four renovations, and it was completely restored in the 1980s. The Cathedral's external appearance is unique. The warm brown colour of its walls goes naturally well with its blue footing and golden domes. The Cathedral’s inimitable shape is emphasised by the well-preserved baroque elements of its façade and chiselled architraves. Due to this combination the palace resembles a gingerbread house or a fairy tale castle. Today the temple complex includes the Cathedral itself, the bell tower and the clergy house. There are several sacred objects in the cathedral, including the Icon of the Mother of God and the relics of Saints Iona and Nektariy of Kazan. The Opera and Ballet Theatre is one of the oldest theatres in Kazan. The majestic theatre, built in a classical style is located in Liberty Square (Ploshad Svobody) which includes a well known statue of Lenin making it a tourist hub. The standing repertoire includes world musical theatre masterpieces, Russian classics, and outstanding works of Tatarstan composers. The stage is equipped with the cutting edge technology that enables special effects and sophisticated scenography. A variety of major international events take place in the theatre annually: in February the International Opera Festival, named after Fyodor Shalyapin and in May the International Festival of Classic Ballet, named after Rudolf Nuriyev. The theatre features laureates of international competitions, and leading world class ballet artists and operas. No play is staged with the same cast of artists, and each opera and ballet is a premiere. Due to high demand we recommend purchasing tickets in advance. Tickets can be purchased online or in person by visiting the theatre box office. The museum, located in the house of the Ulyanovs (Ulyanov is the real surname of Vladimir Ilyich, better known by the pseudonym Lenin) was opened to recognize the 20th anniversary of the October Revolution. Personal belongings, books, home furnishing and even cookware are still in perfect condition and look like the members of the family just left the house for a short stroll in a garden. The house itself is a typical example of the wooden urban estate, with a facade that remains intact until today. The museum is surrounded by a quite garden, which is open to everyone. It is a perfect place to escape the hustle and bustle of the city in the shadows of the age-old trees that still remember the Ulyanovs family. You can buy the entrance tickets and order an excursion in person by visiting the museum. The museum is closed on Mondays. Yelabuga is included in the special guided tour "Pearl Necklace of Tatarstan". In 2007 the town celebrated its 1000th birthday. Yelabuga was home for famous Russian landscape painter Ivan Shishkin and the well-known "Cavalry Maiden" Natalya Durova. Russian poet Marina Tsvetaeva spent her final days here. Yelabuga is a cozy town that has preserved the 19th century atmosphere, where the streets are filled with greenery, where low-rise merchant mansions immerse you into the atmosphere of the past, while the panoramic view to the conjunction of the rivers Kama and Toyma allows one to feel the beauty of Russian nature. The town offers its visitors famous museums, memorial complexes, as well as the picturesque Shishkinskiye Prudy Park where the famous artist painted his landscapes. The landmark of the town is Chertovo Gorodische: the ruins of the Bulgar fortress on a higher bank of the Kama River that filled sailors with awe and terror.